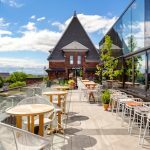 This landmark Romanesque style building in Toronto’s east end was originally built in 1891 as factory offices, and converted a few years later into The Broadview Hotel. By the 1970s the building had slid into decline as a boarding house, and then “Jilly’s” — a nightclub infamously seedy even by strip joint standards. When purchased by the owners, the building was in such disrepair that the entire structure needed to be rebuilt from the inside out – essentially an entirely new building within the old shell. Heritage specialists ERA Architects were invited to restore the building’s rich architectural character and add a glass box to the roof, and DesignAgency were tasked with transforming the confused interiors into a 58-room boutique hotel with multiple hospitality venues — the first in the neighbourhood. DesignAgency developed a concept inspired by the neighbourhood character and the building’s rich and varied histories, while also aiming to establish a new atmosphere all its own. 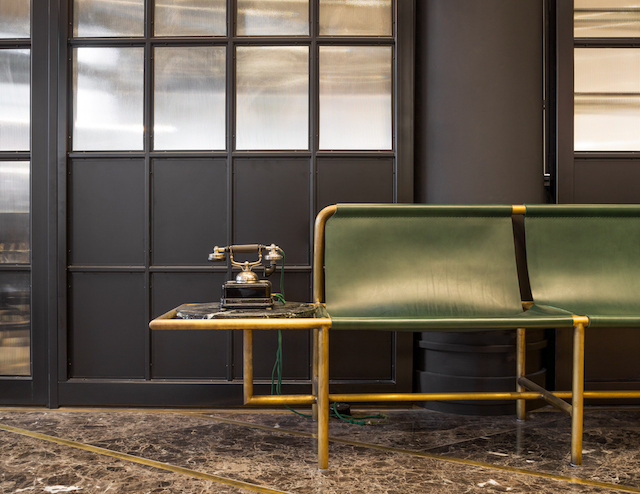 To infuse the interiors with fine grain detail, the designers created bespoke finishes, furniture and lighting, and mixed them with a seemingly ad-hoc play of industrial, vintage and contemporary pieces. 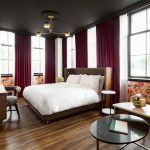 A big impetus behind the Broadview Hotel design was to draw on the talents of local artisans and suppliers – such as botanical arrangements by a local florist, in handmade macramé hangers, mixed with custom weavings and other installations by local artists. A cheeky nod to the Jilly’s era, there are plenty of brass details throughout. 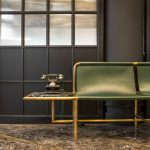 For example, in the lobby, there’s a luxurious custom-designed emerald green leather and brass rail bench, hand-fabricated by Orior in Dublin. Behind the reception desk, a wall of walnut boxes and glass vitrines displays art and curiosities – one of several temporary and permanent installations chosen by a local curator. 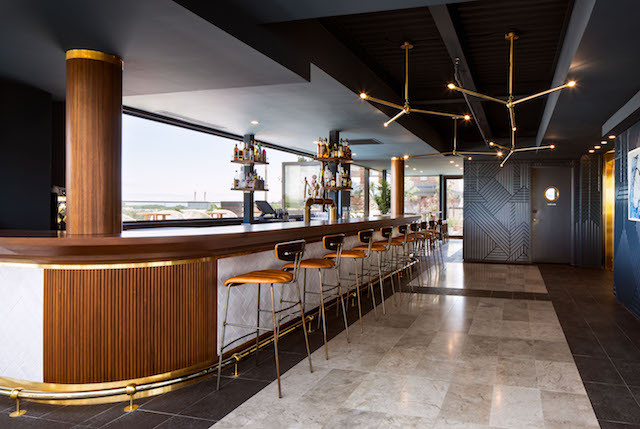 The airy ground-floor café invites guests to sink into leather banquettes or gather at the white marble and brass bar under a halo of pink neon – an artistic installation by the son of the creator of the original Jilly’s sign. 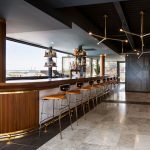 Custom-designed wallpaper replicates designs found during the demolition, and an “eroded” floor mixing wood and tile nod to the building’s layered history. Across the lobby, the restaurant has the richness of a classic tavern, with surprising humourous elements such as drapery with lemurs smoking hookah pipes. 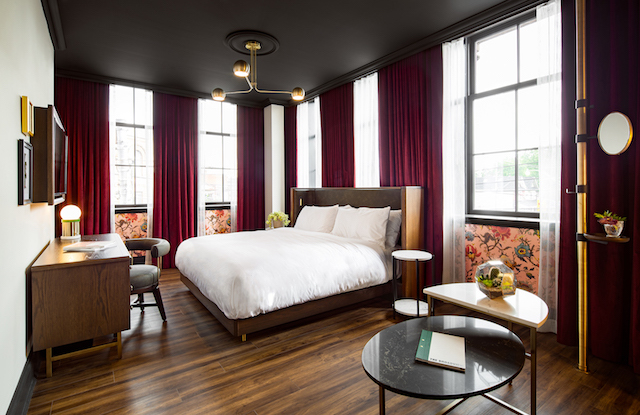 The Broadview Hotel guest rooms, the most spirited spaces of all, mix Victorian-style floral wallpaper and upholstery with deep blue ceilings, red velvet drapery, brass lighting, and even a brass rail to create a playful, modern boudoir ambiance. Luminous white stone bathrooms offer spacious walk-in showers and custom-built vanities. A challenge was addressing instances where the “new” internal building didn’t always line up with its historic shell. For example, in the guest rooms, windows humorously hang at varying heights and where they face a brick wall, the designers transformed the scenario into private micro terraces with lush vertical gardens.